Kirby’s colour was a hot debate for a while at Nintendo. 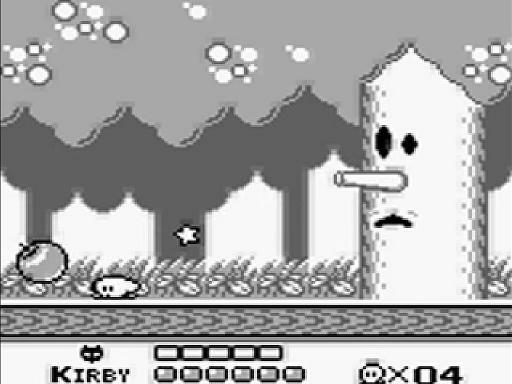 While pink was eventually decided upon, a white Kirby was chosen for the Western box art to match the grey-scale visuals of the Game Boy. It’s hard to know what to think about Kirby’s first ever outing as it either goes all in on the player or not at all. For example, I was about to take a flight to France and thought I’d finally play Kirby’s Dream Land now I had a perfect hour to spare, so I pulled the old Game Boy Pocket out to get stuck in. Merely 20 minutes later, when the plane had only just reached its maximum altitude, the game was over. King Dedede was defeated after only 4 levels and the credits were happily rolling. Admittedly I was stunned, the game was so short and so easy (although the latter was no real surprise considering the designer’s, Masahiro Sakurai’s, desire to create a simple game even beginners could beat). However when credits ended it was revealed that using a simple button combination, there was an extra game to overcome altogether. This time however the challenge was intense, the bosses had become nasty and the enemies far more sophisticated. The level layouts remained the same but the increased difficulty meant it was no longer a mere 20 minutes of gaming. Thus the bizarre truth about Kirby’s Dream Land comes to light, it either caters to complete beginners or experts; there is no middle ground. Due to this a play through of the game can be either quite forgettable or really frustrating and there seems to be no mode that gives us the right amount of challenge to simply enjoy the ride. However this doesn’t mean the game isn’t worthy of our attention; Kirby and his world are full of charm and the titular character’s arsenal is one of the most unique in the platforming genre. 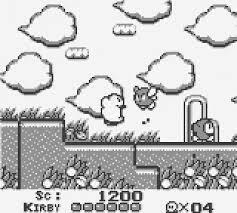 Kirby can inflate his body to float around and then use the air he’s inhaled as pellets to damage enemies. Likewise he can also gobble up enemies and either use them as projectiles or simply swallow them. Kirby himself is almost entirely defenceless (he doesn’t learn his famous ability to copy enemy skills until a later game) and we must use the very obstacles the game has to offer in order to protect the little guy from harm. The ultimate goal of the game is to collect the 5 Sparkling Stars that have been taken by King Dedede and his 4 minions. It is in the boss fights that the game really shines, each one is distinct from one another and (at least in the advanced extra game) all demand a specific strategy to overcome. While we will probably feel completely overwhelmed during the first few encounters, with enough level-headed thinking each one can become manageable once more, making the fights feel very rewarding once we’ve found a strategy that works for us. Sadly though the game demands we fight each one again in quick succession before facing King Dedede, which diminishes the final level effect as it feels we’re being asked to play the game again before we’re allowed to complete it. It’s a setup that has stuck with the Kirby series ever since but in this instance, considering how short the first play through feels the game could have left more of an impression on us if Mt. Dedede had been its very own standalone level before facing King Dedede. This most iconic boss was the first in the game. Others include treasure chests attacking minions, a blimp equipped with a cannon, and a terrifying eye with spikes. 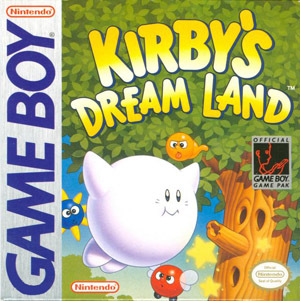 Kirby’s Dream Land is a charming game and it’s very easy to fall in love with the little pink guy as he strides through this relatively short adventure. Yet it is precisely the length of the adventure that gets in the way of it becoming an instant classic and perhaps had there been a mid-ground on difficulty or an independent final level we’d have even fonder memories of Kirby’s first outing. As it stands the game is great to play for short bursts but there are probably much grander Kirby games to play following this one that our more worth our attention today.